Jorde and Wooding (2004) found that while clusters from genetic markers were correlated with some traditional concepts of race, the correlations were imperfect and imprecise due to the continuous and overlapping nature of genetic variation, noting that ancestry, which can be accurately determined, is not equivalent to the concept of race. Paschou et al. 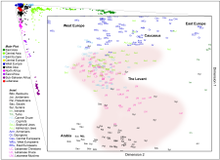 (2010) found "essentially perfect" agreement between 51 self-identified populations of origin and the population's genetic structure, using 650,000 genetic markers. Selecting for informative genetic markers allowed a reduction to less than 650, while retaining near-total accuracy. Cluster analysis has been criticized because the number of clusters to search for is decided in advance, with different values possible (although with varying degrees of probability). Principal component analysis does not decide in advance how many components for which to search, and it has been used in an increasing number of studies. It has been argued that knowledge of a person's race is limited in value, since people of the same race vary from one another. Witherspoon and colleagues (2007) have argued that when individuals are assigned to population groups, two randomly chosen individuals from different populations can resemble each other more than a randomly chosen member of their own group. They found that many thousands of genetic markers had to be used for the answer to "How often is a pair of individuals from one population genetically more dissimilar than two individuals chosen from two different populations?" to be "never". This assumed three population groups, separated by large geographic distances (European, African and East Asian). The global human population is more complex, and studying a large number of groups would require an increased number of markers for the same answer. They conclude that "caution should be used when using geographic or genetic ancestry to make inferences about individual phenotypes", and "The fact that, given enough genetic data, individuals can be correctly assigned to their populations of origin is compatible with the observation that most human genetic variation is found within populations, not between them. It is also compatible with our finding that, even when the most distinct populations are considered and hundreds of loci are used, individuals are frequently more similar to members of other populations than to members of their own population".